Let’s face it, you can usually find me in the kitchen. I am always cooking and my hands are either filled with food or are wet! One thing I love is that the Alexa Show is basically hands free. I can easily state, “Alexa, play cooking with country”, and my music is streaming. It’s great! But the real reason I am writing this blog is because of my shopping lists! I love being organized. I have always been a pen and paper kind of girl when it comes to my lists. I have a million lists including: Target, Publix, To-Do’s, Blog, etc… And I almost always forget to bring an important list that I need with me when I really need it. So Listen to this. I can be cooking and realize I need eggs. So I say, “Alexa, add eggs to my Publix list.” She adds it to my list and that the list is always under the Alexa app on my phone. Of course I bring my phone everywhere, therefore I always have my list. I am not sure if your family also tells you while you are doing a million things to not forget to get their chia seeds, underwear, shaving cream, folder, pencils, etc… like my family does, but most of the time I am not near my lists and it slips my mind. Now my family can add their items to the list when they realize they need it. All they have to say is, “Alexa, add shaving cream to my Target list.” And when I’m shopping I will see the items they needed as well! I am not gonna lie, with two boys in the house I do see poop added several times on my list! But seriously this has really helped me stay organized. As I purchase the items on my list or tackle something on my to-do list I can check it off. I can also edit my list in the app. I can watch videos, movies and TV shows. Make video calls to anyone with Skype, the Alexa app, an Echo Spot, or Echo Show. I see when my sister Jen is home, and we can video chat while we are both prepping dinner! And don’t have to hold a phone while chatting! I can watch recipe videos, cook along to step-by-step recipes and set timers. I also splurged on the Ring Doorbell and LOVE it! I can see and talk to the front door through my Alexa Show. I can also watch the news, see weather forecasts, calendars, and my favorite photos. I also purchased the adjustable stand that is perfect. 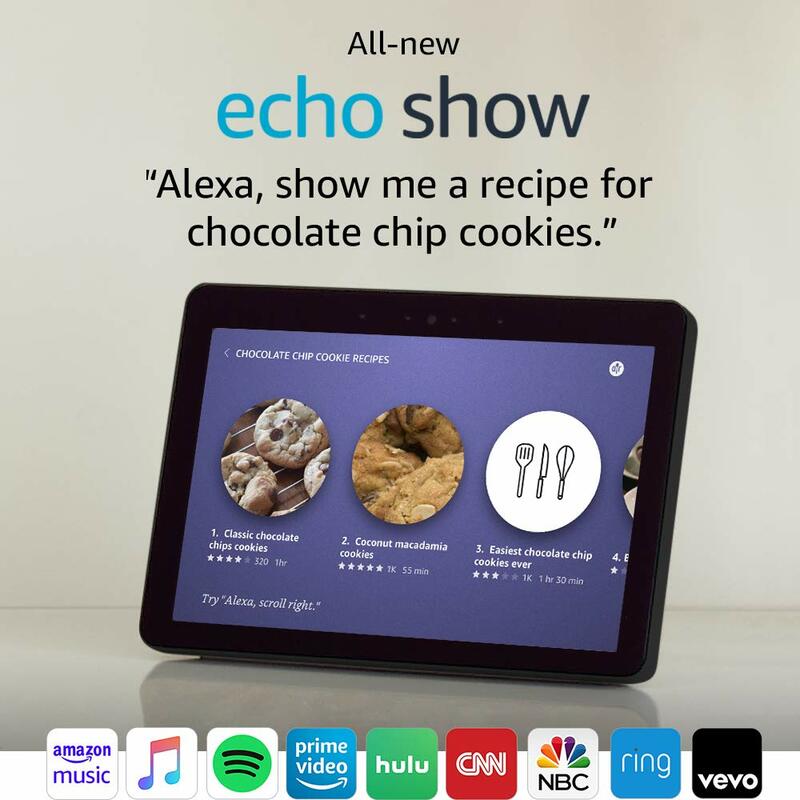 It is a quality stand that I feel you definitely need if you purchase the Alexa Show. Jenga: It is a fun game and you can play it by yourself if no one else is around. Legos: This is my mom’s first choice. She always tells us to play legos. I like legos because it is challenging. Nerf: Nerf is good because it can keep you active indoors. If I’m by myself I could line up targets and shoot. Arts and Crafts: Arts and crafts are good because you can be creative. I’ve written before about the challenges of growing up with curly hair. It took me years to find products that worked for my hair type. All curly hair is different and not all products work for my hair type. The one product I can not live without is Ouidad Advanced Climate Control Heat & Humidity Gel. I have been using it for over 18 years. I’ve tried hundreds of products in between and nothing else works for me. The only way I can wear my hair down is if I style with Climate Control’s Gel. Ouidad was nice enough to let me try two of their new products before they even hit the shelves! This is really exciting to me especially since I am such a fan of Ouidad’s products. They sent me Ouidad Advanced Climate Control Heat Humidity Gel Stronger Hold and Ouidad Advanced Climate Control Restore + Revive Bi-Phase. I wasn’t sure what to expect but I love the results!!! Late afternoon and still good! Clipped on the side and lovin it! If you check out the video below it will explain a little about the technique you should be using when styling with either of the Climate Control gels. Believe it or not that is what I do every time I style my hair. It gets easier especially since I’ve been doing it for 20 years! I’m a pro now. My hair is very thick so it soaks up every product I use. I have to use a lot in order for my hair to not get frizzy. Ouidad Advanced Climate Control Heat Humidity Gel Stronger Hold was kind of amazing. It seemed a little thicker to me but still a clear gel. I didn’t have to use as much when I styled my hair. It really coated every strand. As much as I love the regular Heat Humidity Gel, I have to use a lot of it. And when I style my hair it looks good, but half way into the day I always tie it back because it gets unruly or frizzy. Keep in mind I live in Florida where it is hot and humid most of the year… I am not lying when I say I was able to wear my hair down all day and it did not get frizzy. It was 85 degrees and we had rain showers! Ouidad also sent me the Ouidad Advanced Climate Control Restore + Revive Bi-Phase. It is strong-hold hair mist that controls curls. Because of my curly hair I wash my hair every other day. This product was great to refresh curls late in the day or the next day. You spray it on the curls and scrunch them to nourish and hydrate the curls. It’s perfect for the curls that tend to get frizzy. On me, that is the underneath layer. I really love this product as well. You do not have to use a lot. Just for a touch up here and there. Wide-Tooth Comb– I have one in the shower to comb my hair while the conditioner is in it and one when I get out of the shower to comb the detangler through. Curl Clips-I use them to clip my hair in sections when I am styling it and to keep the roots raised when I am air drying it. Diffuser-Wouldn’t attempt to dry my hair without it! There are a couple of things I love right now! My favorite face wash is Dermalogica Special Cleansing Gel. It is fragrance free and soap free, but does lather! It is good to remove makeup and gives a clean but moisturized feeling after. It is good for all skin types. I have it in a pump in my shower at all times! The MAC highlighter in Doublegleam is a new step in my makeup regimen and this shade is perfect! I dampen my highlighter brush lightly and tap into pot. I just highlight the area under and next to my eye – on cheekbone. I have been using this hairdryer for more than 15 years and it is amazing. It is the strongest and hottest hairdryer, yet NOT one of the lightest. The Saphira Mud Mask is amazing to use as a treatment for your hair or every time you wash. It smells amazing and is the best mask I’ve used in a long time. I used this 3D toothpaste once and had white teeth! Sometimes they even get too white, if I use it daily. It’s great to have in the house. Makes me feel good! Curly hair is a challenge to say the least. The challenge starts once the curls grow in, as you can see from my lovely pics! It is extremely difficult to find a hairdresser that knows how to cut and color curly hair, and they usually never know how to style it! It takes a lifetime to find the products that are best for your hair type and styling it is a whole other problem. Over 18 years ago I went to the Ouidad curly hair salon in Manhattan. When I moved to Florida they started opening up flagship salons and I would drive an hour to a salon in Fort Lauderdale to get my hair cut and colored. Now they have salons all over the country, but I don’t get my hair done there. But I can’t get away from their products. They are really the best for my hair type. Here is a list of some of the best Ouidad products I’ve ever used. If you are not into the Ouidad products, I have heard a lot about Carol’s Daughter, which also specializes in curly hair. I have one of these combs in the shower to comb the conditioner through and one for when I get out of the shower to comb the detangler through. And I wouldn’t attempt to dry my hair without a diffuser.